Mondays symbolize another weekend come and gone, often everyone’s least favorite day of the week. But since I tend to “start” my weeks on Sundays, I have to say Mondays aren’t all that bad. While I’d much rather spend my Sunday brunching or curled up in bed watching Netflix (which is totally acceptable sometimes), setting myself up for a successful week really begins on Sunday morning. Anything I can do to cut time down in the mornings before work is super helpful. Here’s a few tips I use to get myself prepared for the week ahead. Yes, it’s cliché but the saying “fail to plan, plan to fail” is very true if you have goals of eating healthily throughout your week. I usually plan what meals I’m going to make that week for breakfasts, lunches, snacks and dinners, make a grocery list and pick up everything I’ll need at the store. Then, I’ll spend about 2-3 hours prepping what I can. It can definitely be time-consuming, but I feel so much better going into Monday with a layout of healthy meals for the week to get back on track after a sometimes overindulgent weekend. I like to plan at least most of my workouts for the week on Sundays and write them in my planner, that way I have a big picture overview of what my workout schedule will look like. If I’ve scheduled a class and written it down, it’s very unlikely that I’ll forget or skip it – it’s kind of like making an appointment with myself. I can also make sure I’m getting in a good mix of cardio and strength training if I plan it accordingly. While I would like to say I’m perfect and always plan my workouts for the week, sometimes I forget or just get lazy. But by packing a gym outfit and sneakers on Sunday night and throwing it in my car, I know I’m prepared to jump into a class after work or get a quick session in at my gym without having to go all the way home first. 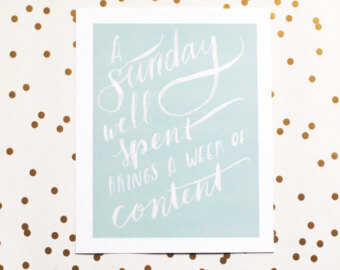 This obviously isn’t something you need to do every Sunday, but I always feel good after I’ve gone through clothes and pulled out things I don’t want or need anymore. I like to keep my closet seasonal, too, keeping a bin of all clothes and shoes I won’t need for a few months in the back of my closet, because who really needs three pairs of winter boots taking up valuable closet space during July? With the cooler weather just around the corner, I spent some time replacing my summery tops and sundresses with all of my fall essentials. This way it’s much easier to pick out an outfit for work or going out without having to throw all of your clothes aimlessly around your room to find something to wear. What other tips do you use to get yourself ready for a successful week?